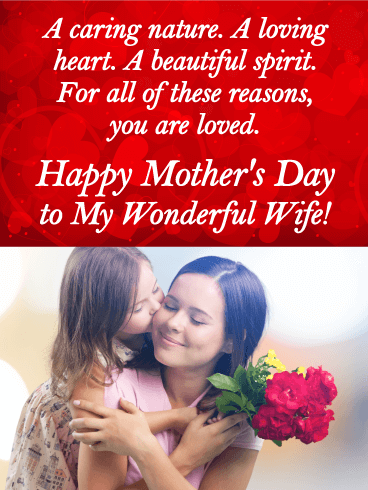 With a background of twinkling hearts that glow so beautifully, and your own heartfelt words front & center, this charming Mother's Day card to a special wife is sure to make her feel loved and remembered on a day that's meant to celebrate the amazing person she is to the entire family, especially you. To My Dearest Wife, I didn't think I could love you any more than I already do, but then I see how our children look at you, and how much you mean to them, and my heart is full. Happy Mother's Day! She has a heart full of love, which she shares with her whole family. It's the reason why you'll forever be in love with her. 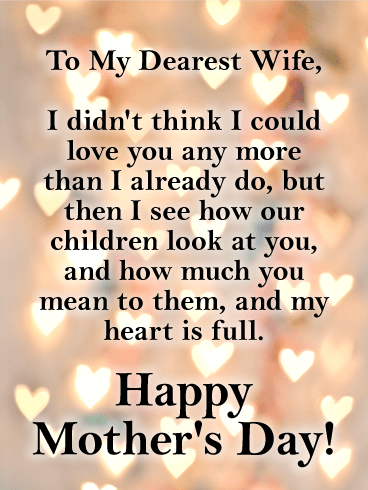 On Mother's Day, surprise your amazing wife with a card to tell her, in your own touching words, just how much she means to you. Featuring the image of a mother and young daughter, flowers in hand, it's sure to bring happiness to her day. Grandmothers are mothers too! Send a heartfelt Mother's Day greeting card to the sweet grandma who raised you like her own. A grandmother's love should not go unappreciated on Mother's Day. If you grandmother is especially dear to you, let her know how important her love is to your life. Send this beautiful Mother's Day card to your grandma today. Grandmas make the world a beautiful place! 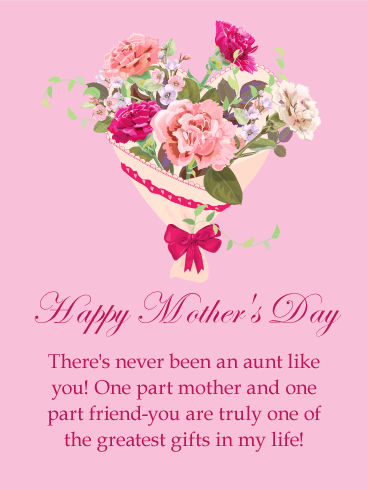 Wish your dear grandma a happy Mother's Day with this beautiful card. Celebrate the light and love your grandma shares and the way she has nurtured and loved you just like a mother would. 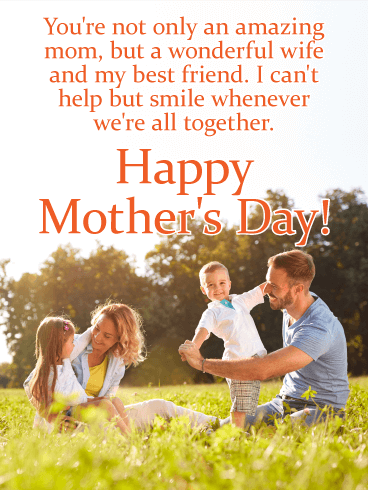 Your grandmother will find this Mother's Day greeting card incredibly thoughtful and it will mean so much to her to receive it from you. A grandmother's love and wisdom is a source of infinite inspiration. 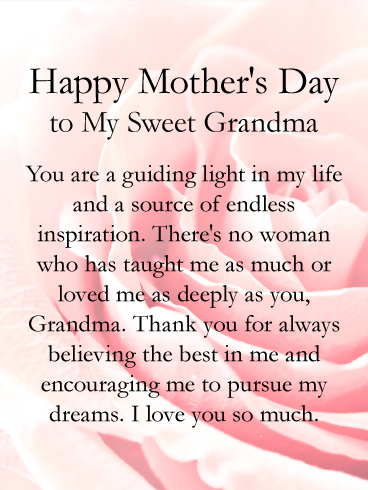 Send a Mother's Day card to your grandma today and honor the amazing woman that she is. Your grandma never doubted you even for a moment. 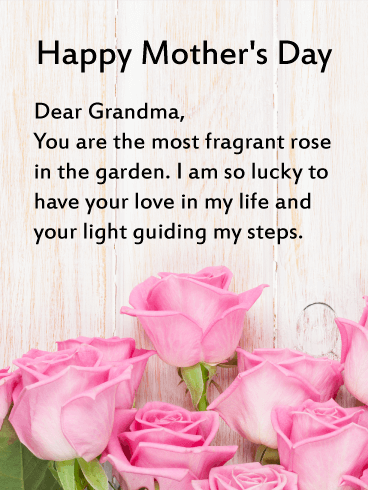 This precious Mother's Day card for a dear Grandma is absolutely beautiful with a soft, pink rose and a heartfelt message of love. Featuring a happy family enjoying a sunshine-filled day together, this Mother's Day card for your wife will have her beaming! 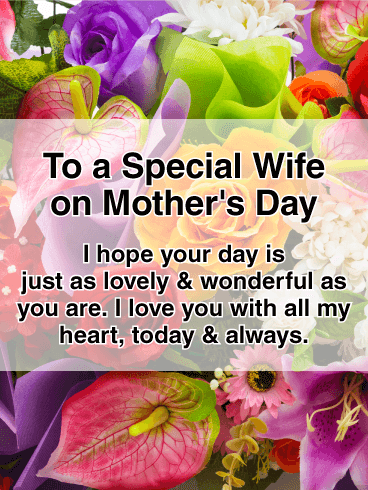 It's the best way to let her know how important she is to your family, especially you. In fact, it's hard not to smile yourself whenever you get to share a moment all together. Sometimes we wouldn't be who we are without a grandmother's love. Honor your sweet grandma with this unforgettable Mother's Day card. 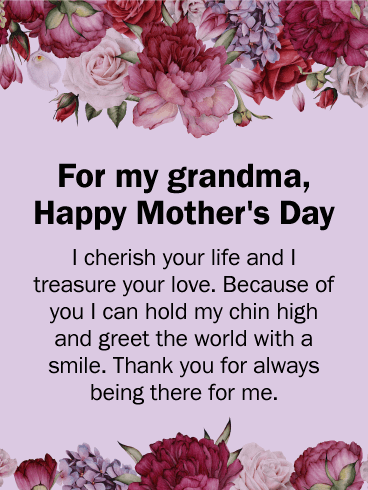 Take a moment to send a heartfelt message to your grandma on Mother's Day so she can feel the full extent of your love for her. There is so much your grandma has done for you, her love knows no bounds. 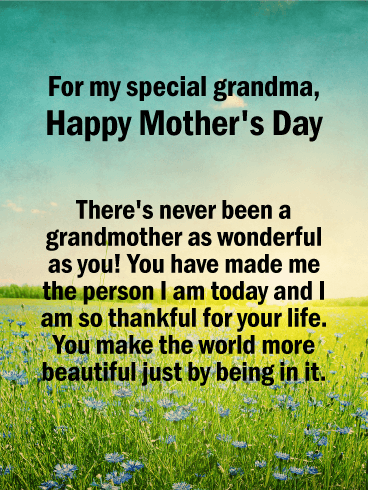 Let your grandma know she helped give you confidence and self-esteem with this thoughtful Mother's Day greeting card and sweet message. 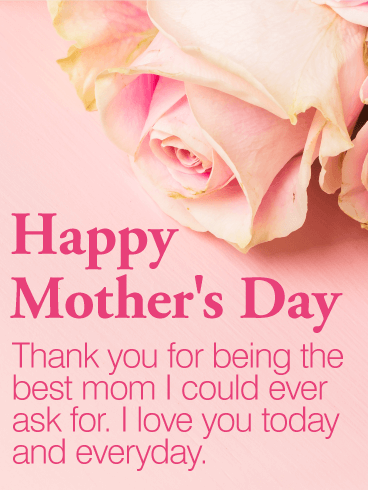 Mother's Day honors any woman in your life who has nurtured, loved, and cared for you as you grew. 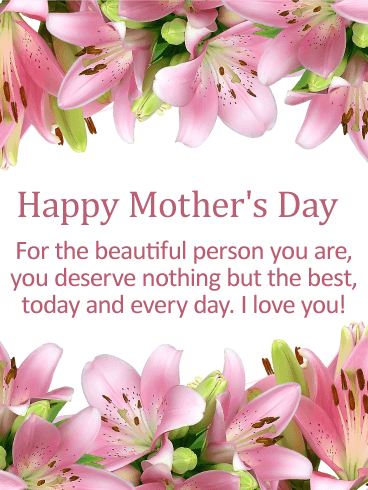 Wish your grandma a Happy Mother's Day and let her know how much she means to you with this gorgeous Mother's Day card. Her wisdom, love, and guidance played an integral part in your upbringing. 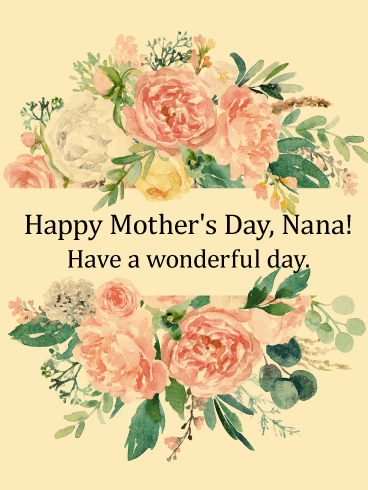 Shower your Nana with love when you send this Mother’s Day greeting card with luscious blooms to her today. There are so many reasons why you fell in love with her. And as you see those same wonderful qualities in your children, it makes your heart full. 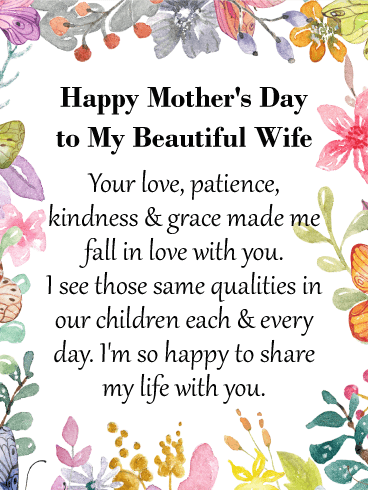 This Mother's Day, celebrate your wonderful wife with this beautifully designed card, which will remind her how grateful you are to share your life with her. A close-up of lovely, colorful flowers adds a charming touch to this card for a special wife on Mother's Day. Featuring a touching sentiment at the center, it's a wonderful way to let her know that you love her with all your heart, today and always.